The Sinn 556 has become one of our best selling watches of all time and for good reason - it offers a great mix of performance, durability and classic Sinn design. This version of the Sinn 556 is marked "A" for Arabic numbers. Sinn's inspiration for the design of this watch is the historic Sinn NaBo clocks long manufactured for use in cockpits as a navigational tool. Even today Sinn continues to produce these clocks which are used in both civilian and military aircraft, as well as specialty cars. We think this watch is one of the most legible that we carry. The four anchor numerals on the quarter hours provide positioning for a quick read of the time. And the bold indices and hands play well against the matte black dial providing excellent contrast. There is a good reason that this design has worked so well in cockpits around the world. The Sinn 556 A features a case size at 38.5 mm which is satinized. This finish results in a slightly more polished look while at the same time retaining some characteristics of a matte finish. This watch is fitted with a Sinn black calf leather strap with white stitching and tang buckle. And what is very unusual for watch in this category is that Sinn has been able to engineer a water resistance of 200 meters rather than the traditional 50 to 100 meters in competing watches. Verified Owner Comments: Absolutely gorgeous watch, perfect size and the 20mm lug width gives you so many options for different straps. Unbelievable quality at this price range. WATCHBUYS has one of the best customer service I've ever encountered. Verified Owner Comments: The watch design I keep coming back to. I have owned the predecessor 656 before and wanted to revisit Sinn with the 556. Clean dial, display back, understated style, checks all the boxes for me. Watchbuys makes it easy to get the watch you want next day. 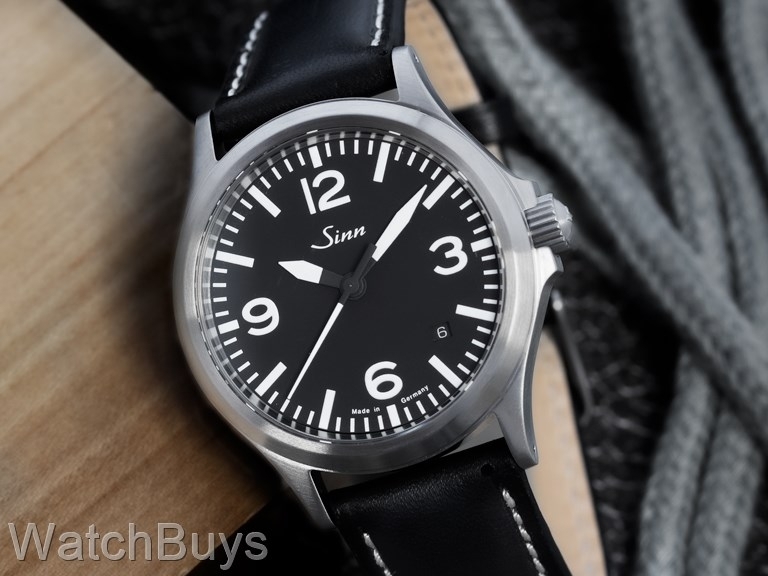 Verified Owner Comments: I have been wearing my Sinn everyday since I received it. I really like the 38.5mm size, and the legibility in all sorts of lighting. The watch has only gained several seconds in the weeks that I have owned it. Overall, I could not be any more satisfied. Watchbuys was very professional in every way possible. If I ever decide to buy another quality German watch, I will be sure to buy from Watchbuys. Verified Owner Comments: This is a great watch and I wish I'd purchased one earlier. A rugged masculine design. Perfect size, very accurate and a nicely finished mechanism. The staff at Watchbuys were exceptionally professional and the packing was perfect. Verified Owner Comments: This is a high quality, no-nonsense watch and is exactly what I expected when I received it. Sinn makes a great watch and Watchbuys was helpful on the phone and the watch was shipped and received promptly. I have a small wrist and this is the maximum size that I thought would work for me, and it looks great. "Sinn 556A - Very Nice"
Verified Owner Comments: I'm very pleased with this purchase, to date. The watch lives up to on-line feedback I had seen prior to purchase. Simple, elegant, and rugged. The 38.5mm case size is a refreshing departure from the trend of much larger diameter watches. The ETA 2824 movement is keeping very good time at about +3 seconds/day. WATCHBUYS fulfilled my order quickly and a nice customer service touch - they had set the watch to my correct date and time and it arrived set to within a couple of seconds of the naval observatories atomic clock. I will consider adding additional Sinn watches to my collection in the future and will definitely purchase from WATCHBUYS again if I do! Verified Owner Comments: I did a lot of research before buying this watch. All I can say is it lived up to every expectation. The finishing and detail are excellent. The strap is nice and comfortable after breaking it in. The 2824-2 is running great at about +4s/day. I also had a great experience with WatchBuys. They had the watch delivered to me in Canada the next day. I will definitely buy from them again. Verified Owner Comments: I own many watches and this one has been on the radar for a few years. I finally bought one and am NOT disappointed. A classic watch that is built to last. Nothing not to like. "Good company to do business with"
Verified Owner Comments: Bought my Sinn 556 on a strap in April 2017 from Watchbuys. Gorgeous dial and looks awesome on a new Grey/Black NATO that I swapped out for the Sinn leather strap. After I placed my order online, they called me before shipping to check in and confirm details. "This one hits everything just right!" "Sinn 556A - Unbeatable Value!" Verified Owner Comments: Beautifully designed and executed watch - case is stunning, with clean lines and finishings. The dial is a modern classic - easy to read with a pilot/sporty look. ETA 2824-2 movement is a time tested and proven engine. Overall, excellent value. This watch has become my daily wear. Looks great with leather strap, NATO strap, or steel bracelet. WATCHBUYS was easy to work with. Watch delivered as advertised and on time. Extremely satisfied customer. Verified Owner Comments: Fantastic watch. Great customer service. I called twice with questions and they were nothing but awesome! Will buy again soon. Verified Owner Comments: This is a great all around watch. It was my first mechanical watch and am very happy with it. It has gotten multiple compliments with its clean features and dial. The crystal seems to disappear at certain angles. I had purchased it with the leather strap and will likely pick up the bracelet at some point. My wrist is about 7" and this is a good size as it seems to wear a bit bigger than its 38.5mm diameter would suggest. The 556A keeps good time and is a great watch to start a collection with. Verified Owner Comments: I've had my 556 for about a month now and couldn't be happier. Really classy and versatile watch. Elegant looking with the leather strap or tough with a nato. I enjoy the simple, uncluttered look of the face and the beautiful open back. This watch can be dressed up or down for any occasion and is built to last a lifetime. "Oh my! I gave it away. Sinn 556A"
The Rolex cost $175 MSRP in 1969. That's approximately $1,000 now. What a 556A cost. And they both are very code to doing what it is they are supposed to do. For me WR to 200 Meters, same as the Sub. Truth is I replaced the Sub with a Mid Size Omega Seamaster. James Bond had a lot to do with why I bought the Sub to begin with. But anyway. What's with the second crown Helium? And the bezel only rotates in one direction. How will I time a steak on the grill? Yeah the Sinn 556A. Not too fancy. But it does what it ought to do. For a lost less than the Rolex Sub's current $7,000 price. "A Watch that says it all. Distinctive and Sporty"
Verified Owner Comments: In my collection- of Omega's and Oris. This watch undoubtedly has the features that make this is one with distinction and sportiness to accompany any occasion. Clear, professional yet elegantly clean. A must for any Swiss watch owner- German watches are comparable. Verified Owner Comments: 13 days since delivery......+19 secs! OUTSTANDING! Everything else about watch is outstanding. 38.5mm dia is my sweet spot. Fit/finish excellent. Most notably, the legibility is the BEST of my collection of approx 30 timepieces. Thanks to Tim for his advise. 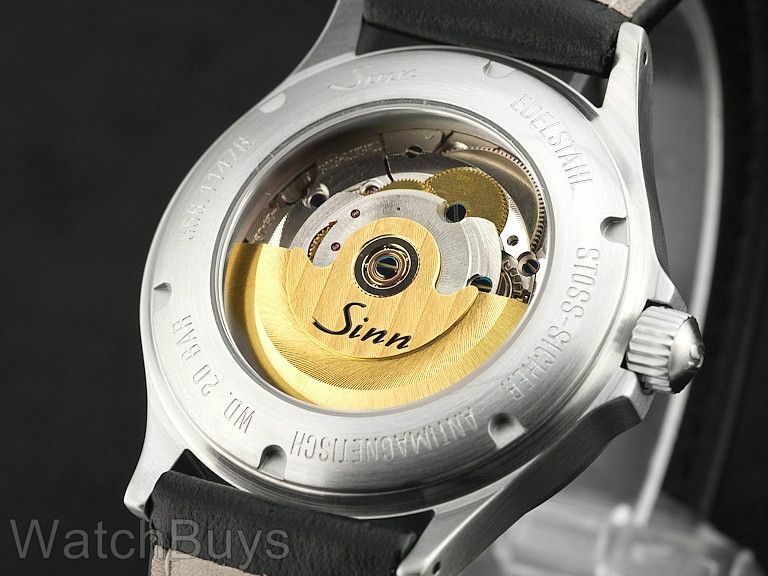 This will not be my only Sinn! Verified Owner Comments: I love almost everything about this watch. I wear it with a red carbon fiber band with the Sinn deployment buckle and it looks great. Always wondered why, unlike the other Sinn watches, this one does NOT say "Automatik" in the lower half of the dial. Also, I agree with other Sinn watch lovers that the satinized finish does scratch rather easily. If I had a choice, I'd opt for a regular polished stainless steel look. One last thing, mine is running a bit slow - sure an adjustment can take care of this. Overall, a great watch for the price. Verified Owner Comments: Excellent craftsmanship. First watch I've purchased in this price category and I am very happy with WatchBuys service and my Sinn watch. Verified Owner Comments: I already own many Sinn watches including the 556I and so I knew what to expect with the 556A. The 556A has the classic Sinn pilot dial which I love so much. The time is instantly legible, the lume is excellent and this is the only model sporting that lovely dial that comes in a satin finished case. The fit and finish is absolutely top notch as in every Sinn watch. This series has a smaller case size than I have worn in the past few years but on a Maratac Zulu strap it feels a bit larger and is extremely comfortable. I can't say enough good things about this watch and also the sister model, the 556I. I switch back and forth with these two every day. "Very simple but elegant timepiece"
Verified Owner Comments: I ordered this watch after debating a series of slightly more and slightly less expensive timepieces. I had it in mind to buy a watch that "watch people" would know and like but "non watch people" would never have heard of. I wanted a classic look watch without a lot of hoopla or more than 40mm, that I could wear to work or out to a formal affair. I have been extremely pleased with the Sinn so far. I have two minor issues: one is that the power reserve seems fairly small to me it really needs regular winding or wearing and two, the seconds hand ticking isn't as smooth as I'd hoped. But it nailed what I was looking for in a daily wear watch. Verified Owner Comments: After much looking at other German watches like Damasko and Glasshutte, I chose this model to replace my Breitling Chronospace. "What is it about this watch?" Verified Owner Comments: Balance and Proportion that's what. It seems that watch devotees, including me, are obsessed with this watch (or its cousins 656, and 856). Everything is in perfect balance. The size and shape of the numbers, the way the hour and minute hands are in proportion and tapered just right. By contrast, take a look at the current Bell & Ross 123 or 126. Those large, skinny numerals look awful. I have an IWC Pilot Mark XVI, a Rolex Explorer II, a Fortis Cosmonaut and a Muhle Glashutte SAR; but the 556A is the watch I wear. I hardly even look at my other watches. Verified Owner Comments: Great look and feel. Had been debating between several pilot style watches, but didn't want something over 41mm. Went with this over the IWC and I am very happy with my choice. Unique and well made. Keeps very good time. Word of warning the case does scratch easily. Verified Owner Comments: Nice watch.